"Are you a good witch or a bad witch?" asks the introduction to "The Gray Witch's Grimoire", a new book of witchcraft and spells both dark and light. To that question, author Amythyst Raine replies: "I’m both and I’m neither." She is, as the title suggests, a gray witch, and she goes on to say: "In our society ‘dark’ is automatically viewed as ‘evil’; and ‘light’ is automatically viewed as ‘good’. We’re expected to live completely within one realm and to totally avoid the other." But the traditional wise woman wasn't always a fluffy bunny. She knew how to heal and how to protect, but she also knew how to use her magic to catch a thief or see that someone who deserved it got their comeuppance. The wise woman knew the world wasn't all black or white, it was shades of grey - and so was she. Amythyst adds: "The gray witch abhors violence, hatred, and conflict as much as the next person; but she’s not afraid to face these issues using the power she possesses to right a situation and reinstate balance." The Gray Witch's Grimoire has the subtitle "A magickal formularia to guide you through the mysteries of witchcraft in the spirit of the ancient wise-woman". It contains spells from a variety of sources - including hoodoo, traditional folk magic and modern Wicca - that could be classified as white magic, black magic and somewhere in between. However, the book is more than just a list of spells and how to cast them. The first section is a complete introduction to an eclectic style of witchcraft including a code of ethics for the gray witch, the principles of magic, the necessary knowledge of magical techniques and tools, and the practicalities of how to put it all together. It also explains that, traditionally, a witch did far more than just cast spells. Blessings, being able to communicate with spirits and animals, weather control, healing, divination, herb lore, knowledge of stones and crystals, shapeshifting and seeing visions were all within the traditional wise woman's purview. And, of course, the wise woman was also meant to be wise - and offer good advice that would solve problems. The second section is about magical rituals. It starts with basic details of how to cast a circle and goes on to cover ceremonies such as handfastings and words to say after someone has died. The third section includes all those naughty spells. It starts with a number of love spells - spells to get the attention of the person you fancy, to stir up lust and to make yourself more attractive. There are also spells to make a person do what you want them to do, to help you win a legal battle or court case, to attract money, to find out the truth when you think someone is lying to you and, of course, a few choice curses to be used if the situation really deserves it. There are plenty of "nice" spells, too, for healing and protection. To be honest, I hope I never need to curse anyone. I am of the opinion that what goes around, comes around, and that curses can rebound on the caster. But I also believe it is important that a witch knows how to curse, even if she chooses not to use that knowledge. 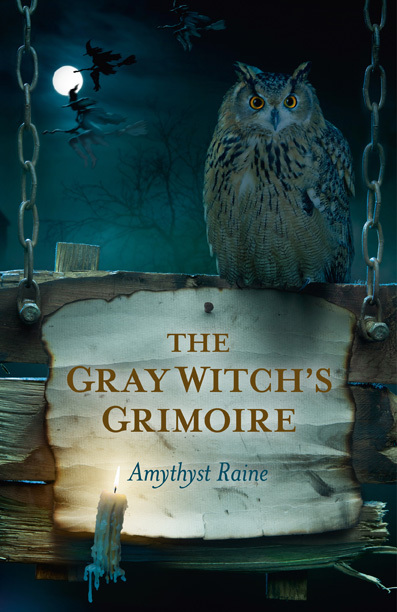 Publisher Moon Books says on its website: "By reading The Gray Witch's Grimoire you will empower yourself through ancient mysteries, secret rites, and magickal spells that leave the world of the mundane behind and nurture the wise woman in us all." I would agree that this is an empowering book, and a useful addition to any witch's bookshelf. I was lucky enough to read an early version of it before it went to press and I am glad it is now published and due to hit the bookshelves this month. Author Amythyst Raine is a professional psychic/clairvoyant practising her own brand of witchcraft in the American mid-west. She is an eclectic witch who has developed her own spiritual path over the years, a combination of hoodoo, Dianic Wicca, and green witchcraft.